So this seems to be a good time of year to run a Kickstarter campaign. I only say so because my wallet is certainly suffering due to all the high-quality toys & games being offered right now. Sure, I have to wait a while to actually receive my purchase. But I’m happy to support these companies and their efforts to bring a product to market that might not otherwise have seen the light of day. A few days ago I told you about one of my purchases, Temporal Odyssey. I figured today I’d let you in on another. My daughter walked by my desk the other day and saw information about a brand new campaign on Kickstarter that I had pulled up. I was completely unfamiliar with RWBY, and my 40+ year old brain was stumped just trying to pronounce it. But Madison knew right away what it was and explained that it is pronounced “ruby” and is a super-popular (with her generation) anime-style web series produced by an equally odd-named company, Rooster Teeth. The show is set in the fictional world of Remnant, where young people train to become Huntsmen and Huntresses to protect their world from the creatures of Grimm. The first season made its debut online in 2013 and is getting ready for their 5th season to go live later this month! Exact numbers are hard to tally, but it is safe to say that RWBY enjoys a following in the millions and enough for Warner Bros. to sign and distribute the series in Japan! So how to capitalize on this free-to-watch web series? DVD’s and other merchandise are already in stores. But none of them engage the fans like what we recently discovered on Kickstarter. 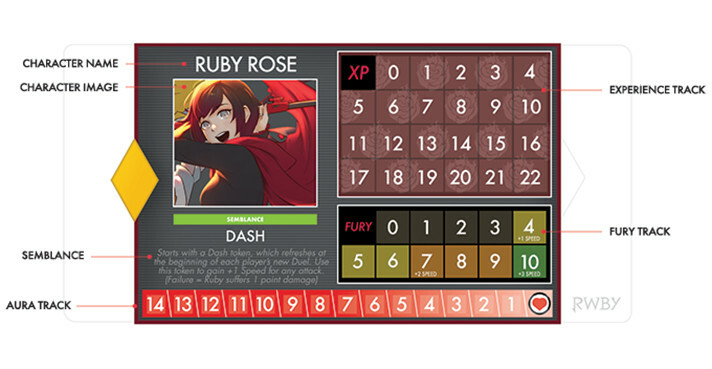 Our friends at Arcane Wonders have teamed up with Rooster Teeth to bring the RWBY world into your home with the brand new RWBY: Combat Ready cooperative card game! 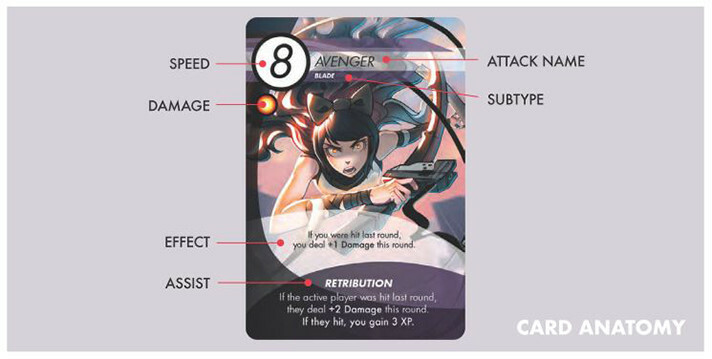 Each player has their own unique deck with cards that represent the exciting actions, moves, and attacks they perform in the series! Each player also has a Scroll to keep track of their Aura, Battle Fury, and experience. The villain’s Aura and other stats are tracked on the main game board. The back of each of the villain’s cards shows him in a particular combat stance. Each stance gives a hint as to what kind of attack the villain may perform next as well as its relative speed. Stances come in three types: Aggressive, Balanced, and Subtle. 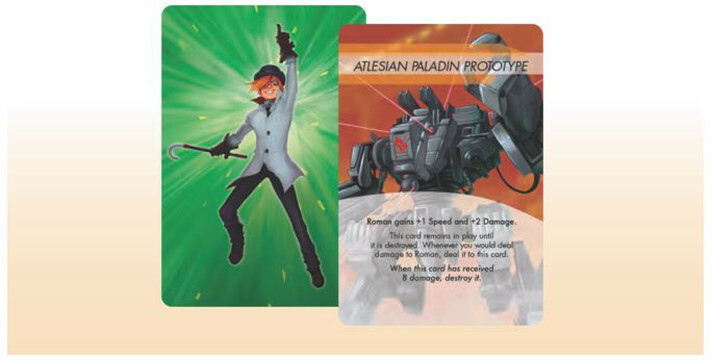 The stance of his next attack card is exposed at all times, allowing the players to plan in advance. For each round of a duel, the center stage player chooses and plays an attack from their hand. 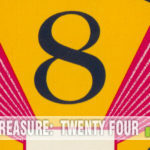 Afterwards, the villain’s card is revealed and the round is resolved. Each attack has a speed in its upper left corner. The two attacks’ speed values are compared, with the faster attack hitting and inflicting its damage on the opposing character. If the speeds are tied, the round ends in a draw. When a player wins a round of combat, they gain experience and build Battle Fury. Their Battle Fury increases by one point per point of damage dealt. Once enough Fury accumulates, it can give them a passive bonus to their combat speed. They may even channel their Fury to attempt a spectacular ultimate attack! When a player is hit, they lose their Battle Fury, making it important to play cards very carefully and try to win every single round of a duel. Ultimates not only deal additional damage, but they also reward lots of experience, and they bash the villain away, immediately ending the duel! Player experience can be spent to gain improved attacks and abilities by purchasing new cards for their character decks during the battle. While the center stage player is fighting the villain, sideline players can battle Grimm, deal with side objectives, and assist each other in various ways. 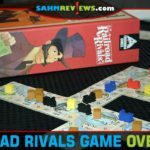 Grimm and other minions join the battle over time as the result of various objectives, and will continue to accumulate and apply pressure unless dealt with. They enter play face-down until they are attacked, which reveals their speed and other attributes. If the player’s attack is slower, the Grimm deals its counterstrike damage to them. At the end of each duel, any remaining Grimm damage the center stage player, making them dangerous to ignore. Like most Kickstarter campaigns, RWBY: Combat Ready has a couple different pledge levels to consider. The base game is only $45, but if you’re buying it for a rabid fan in the household, consider one of the higher tiers that include extra swag. Delivery of your game is expected for next summer, so you’ll need to commit now to be able to be one of the first to play the first RWBY board game. Even if you have no idea what RWBY is, odds are that your kids do. Surprise them with a copy of RWBY right after school gets out for the summer and be the coolest parent on the planet! Tell the truth, had you heard of RWBY before? I have never heard of this before. But I can totally see the appeal. It seems really fun! I have never heard of this RWBY Combat Ready Game. Looks like fun for the family. A game in which players train to become Huntsmen and Huntresses to protect their world from creatures sounds super fun! 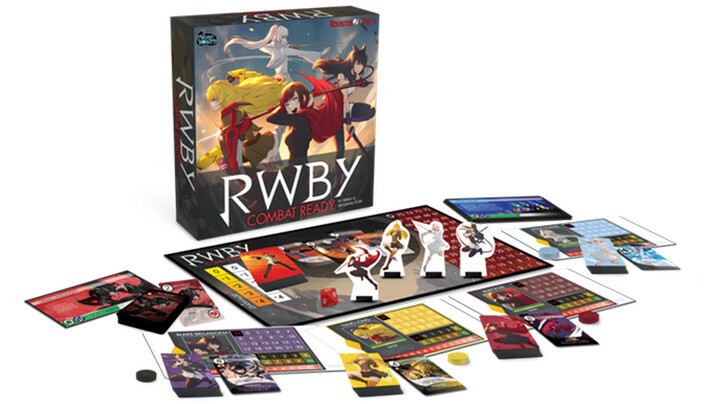 RWBY Combat Ready Game sounds like fun for the entire family! Wow. That’s a pretty impressive game! I bet the families will really have a great time playing. I hope it works well for the brand. I just saw an email about this the other day. I hope they do well with their kickstarter, RWBY Combat Ready Game sounds like a game we would love to have in our home! I have never heard of RWBY before. I would not have guessed it meant ruby for quite some time if at all given the chance, I’m not the greatest with things like that. Honestly never heard of RWBY before! 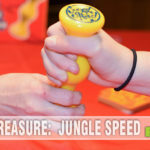 My family is always looking for fun games that we can play together. Will have to keep this one in mind. Ooooo now this looks like one awesome game! 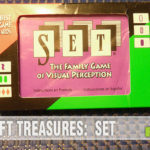 Perfect for family game night! I think the fam would have a blast playing! I haven’t been in Canada yet. Quebec is definitely on my list. Thanks for sharing your experience. I hope I can visit Quebec soon. Ny son would love this game. Never heard of it but might play it. This looks like a fun family game. Thanks for the overview. I had not heard of this series before.